So-called “Roundup-ready” seeds — for crops that can withstand the non-selective herbicide glyphosate — have become popular in conventional farming because farmers can spray entire fields with Roundup to kill a variety of weeds but not the crop. Much easier than cultivating or spot-spraying. But as with many “advances,” we now are finding unforeseen consequences. There are two ways to protect your family from being exposed to an overdose of glyphosate: Grow your own food using organic methods, or buy organic. I do both. Read about the science of this important aspect of food safety. The weather has been relatively warm and sunny lately, so I decided Earth Day would be a good time to start spring planting, somewhat earlier than usual. Harper supervises planting in the early-season bed on Earth Day. I also wanted to introduce my new garden helper, Harper. She is a 3-year-old yellow lab I adopted on March 31 from BrightSide Animal Center, where I serve on the board of directors. She’s a good dog, but I have to watch her in the vegetable garden. She likes to eat the asparagus as soon as it comes up! Renee Shepherd is the owner of Renee’s Garden. As I prepare to order seeds for the 2015 season, I wanted to pass along a tip. If you are perusing garden catalogues deciding what to order, please consider Renee’s Garden. Why? Renee Shepherd has been committed to organic gardening for more than 25 years. She selects seeds that germinate reliably and varieties that are easy to grow. And, she will donate 25% of your purchase price to the Central Oregon Master Gardeners Association — which provides free, research-based garden information in Deschutes, Crook and Jefferson counties in Oregon — if you enter FR663A in the coupon code box at checkout. Thank you, Renee! 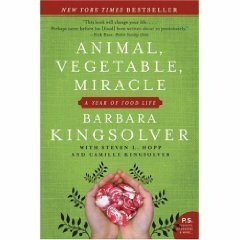 There are many books I’ve loved, but Barbara Kingsolver’s “Animal, Vegetable, Miracle: A Year of Food Life” is one that actually changed my life. After reading Kingsolver’s saga of living a rigorously local diet, I realized that with my vegetable garden and the farms and ranches nearby, I could eat almost entirely locally without too much effort. I’m not doctrinaire about it — I still want coffee, bananas, lemons — but I have been making a conscious effort to choose what is grown or raised locally. Much of it I grow myself. 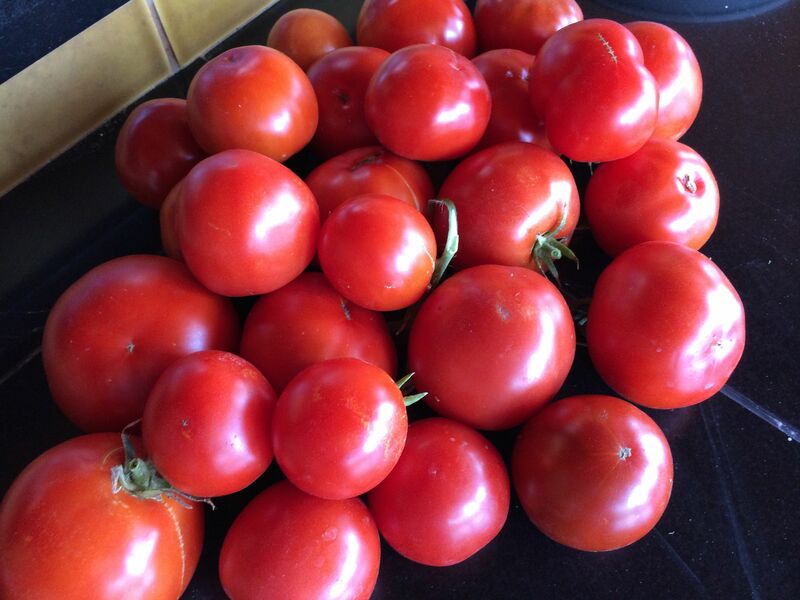 Still harvesting beautiful tomatoes in late October — amazing! 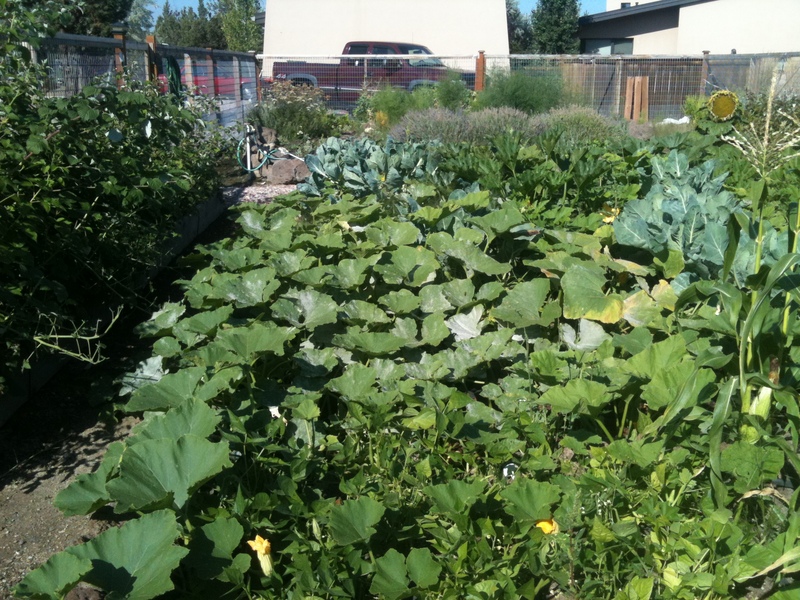 Growing vegetables is not easy in the high desert climate of Central Oregon, where nights are cold and days are dry and windy. But this summer we’ve had the most favorable weather conditions I’ve seen in the past 10 years: very warm nights all summer, and that’s persisted into late October. Still harvesting tomatoes, chard, raspberries, strawberries, green beans, winter squash. Have yet to dig potatoes and carrots. This has been the harvest that won’t quit. But today irrigation will get blown out for the winter, so time to do final harvest and start cleaning up. Thriving summer and winter squash, eggplant, onions, brussels sprouts. At left, raspberries. In background, beets, asparagus, lavender, lettuce, swiss chard, radishes and carrots. In the high desert of Central Oregon we typically have a short growing season because even when the days are very warm, nights are cool enough (below 50 degrees) that plants stop growing until it warms up the next morning. This delays maturity by about two weeks. This year, however, we’ve had unusually warm evenings, as well as unusually hot days in July. That extra warmth — plus a lot of regular watering — gave us vegetables on steroids this year. 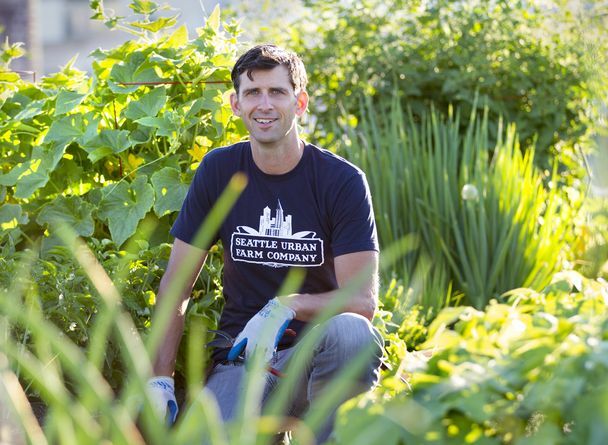 I was glad to read in the Seattle Times about the Seattle Urban Farm Company that is bringing vegetable gardening, berry bushes and dwarf fruit trees to rooftops and backyards in the city. They’ve also created a farm in the suburbs where they do contract growing for restaurants, and have a forthcoming book on how to make vegetable gardens more productive.